I don’t know for sure why I dump my laptop then, but when I can see the entire book in my head, I need grid paper and sketchbooks and colored pens. I need a print-out of the book and colored pens. And most of all, I need a whiteboard and, yep, colored pens. Okay, I do know some of this. I know I love the non-linearity of the grid paper and cards, the ability to go in all directions at once as I diagram my plot and character arcs over and over again as I write. Sometimes I doodle ideas and that’s harder on a computer, although there’s my iPad screen with its pen, but I think I just I crave the feel of paper under my hand, I want to see the ink flow in the sketchbooks, I want to be connected to the experience, not just feeding information that magically appears on a screen I’m not supposed to touch (that’s the laptop, not the iPad, my fingerprints are all over the iPad). The picture above is the first two acts of Lavender’s Blue. 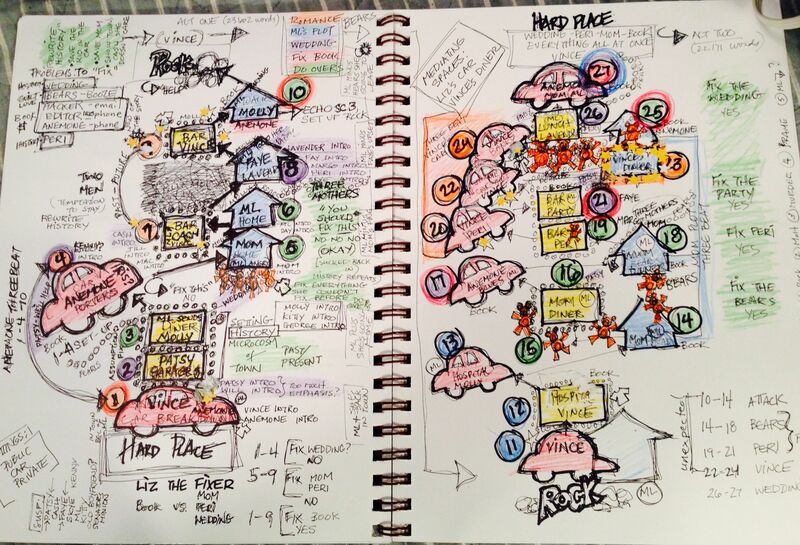 The majority of the scenes there are either in cars or houses; Liz trying to escape or Liz trapped, and I wanted to see the distribution. The names inside the icons are the antagonists. The teddy bears are a motif throughout and I wanted to see how they were placed in the story. It’s act-by-doodle, and it gives me a different way to picture (in this case literally) the plot, and it’s all in a notebook that’s much harder to lose than a piece of paper. Plus because it’s a sketchbook, the paper is a lot tougher and I can do some real damage with markers without destroying the whole thing. Also it’s fun. I do know why I need the print-out; it’s because the book looks different on the page than it does on the screen. It’s like meeting somebody you only know at work when you’re at the grocery store; you see a different person. I print out the book and see a different story. All my mistakes glare; connections I’d missed become obvious; parts that drag, drag more; parts that are too fast whiz by. I love the print-out stage because I get to read a new book. I’m less sure why I lust for a whiteboard at this stage. 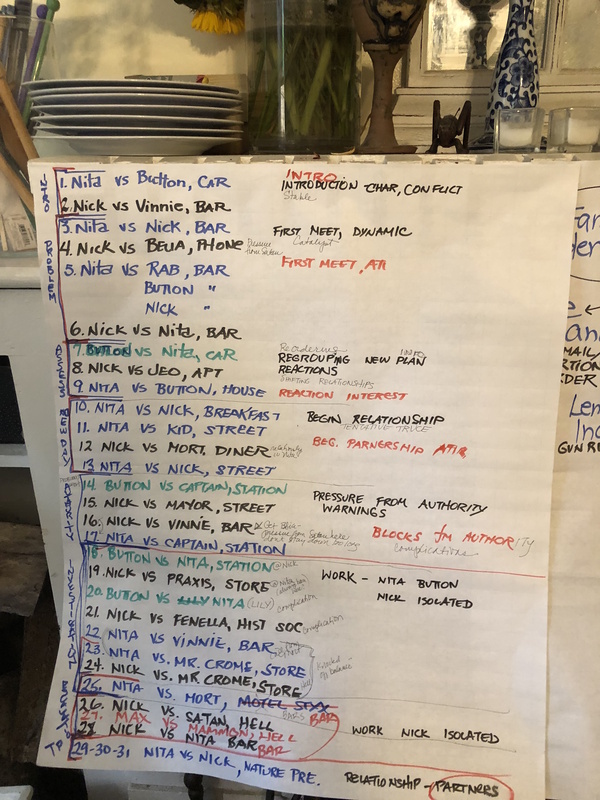 There is real value in being able to see the entire book on the wall before me, divided into acts, blocked into scenes and scene sequences, color-coded as to point-of-view character, symbols indicating subplots. It gives me the entire novel in one graphic. But I’m getting the same thing, basically, from the easel-sized post-its I bought until I can put up a whiteboard, and it’s not what I want. I need to see it on a whiteboard, not four giant Post-its. And for right now, as I mentioned above, I’m using giant post-its for Nita. It’s just not the same. It is still valuable, though. Among other things, this first pass shows me that I’ve completely borked the Button/Max subplot in this act. Back to the drawing board giant Post-it. The paper thing is interesting–Krissie feels about Clairefontaine the way I feel about graph paper and sketchbook pages–but I think her penultimate sentence in the key. I cannot explain why I need the whiteboard, but I know I shouldn’t fight it. 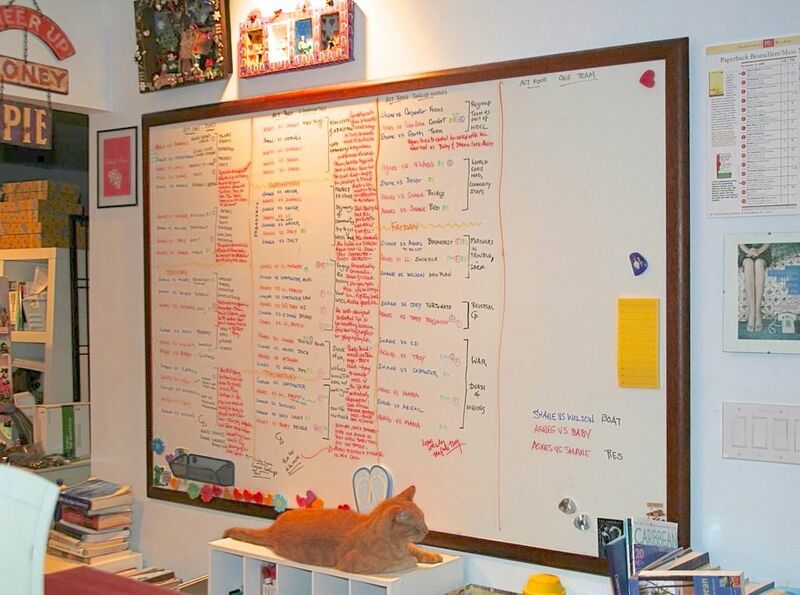 The Girls in the Basement know what they need, so I should just order the damn whiteboard, rearrange my living room to open a wall for it, and then get back to figuring out Button and Max’s subplot arc. The writer’s heart knows what it wants and in my case, that’s a white board and many, many colored markers. I was doing a booksigning once, and this woman who looked very familiar came up with her book and said, “We just don’t see enough of each other,” and I bluffed and said, “We really don’t” while not knowing who she was. About five minutes later, I remembered: She was my aunt. Do not talk to me at book signings, I’m a complete idiot under the stress. Completely sympathise. I had to ask one of my nephews his name at the end of a long book signing. And then I spelt it wrong. I ran into a cousin I hadn’t seen in ten years and I won’t even get into how I thought she was someone else with the same name. I keep wondering if whiteboard paint would help you fit a “whiteboard” into your space better since you were struggling with where it could go. Of course, you still need a wall, so maybe it doesn’t matter whether it’s a board or paint and maybe it’s better for you if it’s portable so you can look at it wherever you’re working or maybe there’s something about it having some boundaries that’s helpful. You’re right, just get the girls what they’re requesting. They have their Reasons. The giant post-its are actually too small. Also, you can’t erase them after a couple of weeks go by. I’ve never tried the Post-It whiteboard paper but the other stuff I’ve tried doesn’t work at all. The problem with whiteboard paint and whiteboards that are just white paint on steel is erasability. I leave the notes up for weeks and the marker sets on white paint. I have to use bleach to get the marker off a porcelain coated board, but it does come off. This is probably a stupid thought, but could you buy two half-sized whiteboards and hinge them together with piano hinges? You’d need enough swing space to get one open all the way, which is unlikely to happen in a cottage, but your overall wall requirements would be lessened. Oooh, or chain several together in accordion-fold! If there’s a frame piece on top and bottom, then the surfaces don’t touch and folding won’t result in accidental erasing, either! I’ve worked in meeting rooms where ALL the walls are whiteboard (except the internal corridor wall, which is glass). It’s great for brainstorming. They have lots of natural wood in the room (furniture etc) to balance it. Is chalk not an option? It bypasses some erasability issues with whiteboard paint or whiteboard post-its. They have some really nice and precise chalk pens nowadays. Chalk? Nope. I want the contrast and chalk is soft. Really, the Girls know what they want. I think you can get chalk markers. Restaurants use them. Yeah, I used one to pre-sketch a T-shirt paint design. They load in a water-chalk solution that seeps through a regular marker tip. So for contrast, you can still get different chalk colors, though it means you’ll have to get a dark colored surface to draw on, instead of white. I started dipping into the literature on Mihaly Csikszentmihalyi’s Flow which is a positive psychology theory. We work well when challenged, interested, able, and we are not frustrated, bored, lacking ability. I think that the body being engaged helps cause a sort of zen mind-body connection that our brain enters and performs what is required. I loved the Flow book, but it’s been years since I read it. Must reread. Yes, I loved to think on a white board when I had one, when I had a job at an office. The Girls know. I definitely need a print copy. (Although I remember typing all my early work and I, with you, would never have published a book if they hadn’t invented computers.) I just went through the printed version of the current WIP (about 50 pages) and found minor errors all over the place that I missed on the screen. I do some of my brainstorming or outlining on paper, but then I have to type it into the laptop for ease of use later. Your process just fascinates me. It wouldn’t work for me, just like writing to a playlist or sitting in a coffee house don’t work (although ironically, my protagonist is a writer and sits in a coffee house…), but I love the glimpse into other author’s ways of doing things. I tried to learn Scrivener twice it also just didn’t fit the way my brain works. On the other hand, I usually do outline, and many of my author friends don’t. All the Girls have different demands, and heaven help you if you don’t give in. Buy the whiteboard! I wrote my most recent book in longhand, because I had become so frustrated with my voice recognition software. I doubt if I’d have done it if I could still type large screeds by hand, because I love typing and it works well with my brain. But RSI is an issue, hence the voice software. Writing by hand was actually fun. And when I’m stuck I always go back to handwriting – work out a scene on paper then read it into the computer. I also do most of my initial plotting longhand on scrap paper. It’s something to do with mess – I need to be able to make a lot of it. I can’t be messy on a computer, so this bit always happens by hand. I can be messy on the computer – but then I can’t see the parts. Sometimes I can’t find things I know I wrote. Basically, it’s handwritten mess married with computer mess. One day my head will explode because I can’t find something I know I’ve written. I need like, five computers all with a different thing on the screen, paper, collage, sketches and post its. And a room to hold all the things. Luckily, I only need all those things for my own work. Ghostwriting is much simpler. Thank goodness or my brain really would explode. That’s why I bought a 27 inch iMac seven years ago: so I can have multiple documents in view as I’m editing. (Also to give me lots of room to edit my photigraphs.) I’ll often have three across the screen and a couple of others peeking out so I can click on them, plus a couple of dictionary panes. Older, rounder woman wearing ordinary clothes moving slowly enough for me to see what she is doing. No talking. Not best for first step learning but once I started getting the general idea her video let me feel like I could do it without having to get into shape (and grow younger) first. She looks incredibly balanced and at peace. 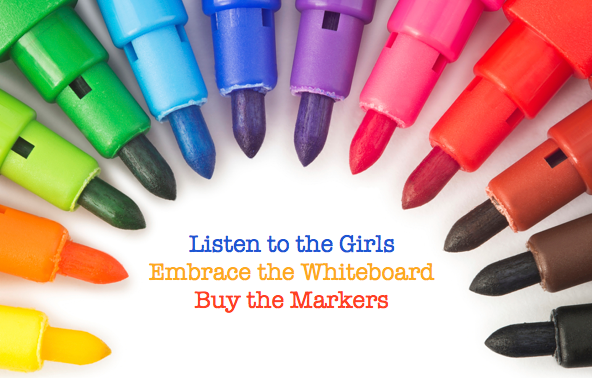 I think part of the appeal of the many colors of markers is for the art teacher in you to be able to come out. Writing uses a different part of your brain, but perhaps for a visual person seeing all the colors encourages the other side of you mind to help rev up your imagination. But since I know less than nothing about brain science, this theory is probably just late night rambling. I dunno. I swear I was a million times more productive all those years ago on my lovely SCM portable electric (or even the manual that preceded it). I could produce a darn good first draft covered with typing and xxxxxxx and then the next draft consisted of circles and arrows and lines drawn through the first draft, and LITERALLY cutting and pasting (okay, actually I used scotch tape) from one page to another, to rearrange or insert the newly typed stuff. And handwritten additions scrawled sideways in margins. Then the final copy + cc, using whiteout or that white type-erase stuff (I still have some in my desk drawer; I guess I should toss it, eh?) that you just type over the letters in white. And carbon paper, of course. Magic tape was the best: you can write on it in pencil, so you can edit the taped-together rejig. Known as a scissors-and-paste job, and usually done at home rather than in the office, so I could lay everything out on the floor. Having flashbacks to journalism school days: newsprint and rubber cement. Having flashbacks to when I worked at a small newspaper in Sacramento. We rolled melted wax onto the back of the cuttings to place them on the template. It was usually 3 am before we finished, but sometimes we worked all the way to the 6 am deadline for the printer. I introduced the editor to Pagemaker and things began to move much more quickly. Seems like I have a different process for every book I write, but I can’t seem to get a handle on which process works best. It’s been a 20 year leaning curve and I still haven’t figured it out! But there always come a point where I have to print the whole thing out and edit in pen because I can’t “see” the story on the screen. I wonder if there are white boards that are reversible? White board on one side and a place to put art prints on the back. Or notes. Double duty. I know there are some with corkboards as part of them. I do a lot of note-taking, brainstorming, etc with pen and paper, probably because I do a lot of my planning + plotting + research at work (sssshh!) and it’s easier/more comfortable for me to do it manually in the two minutes here, three minutes there that I typically get. Then of course I end up with this palimpsest of scribble that has to be deciphered, but maybe the decipherment is part of the process. When it comes to actual composition, it’s definitely all on the computer. My first book was composed on one of those early stand-alone word processors with a floppy-disk drive. 🙂 Trying to write a book in longhand … I get a cramp just thinking about it. This is fascinating. So many people say they can’t “see” the story on the screen. When you guys are casually reading, do you see the story differently depending on whether you are reading Kindle or paperback? The only difference I feel is that I am much more likely to “scribble in my book” if it’s a Kindle. The margins (well, note-taking capacity) is practically infinite on an ebook. I really love using track changes, too, when I’m reading other people’s early drafts, although I don’t really use the track changes a lot on my own work. For that, I prefer to print it out and use the colored markers and post-it notes. Or copy it over in a new document and cut-and-paste electronically. I feel safer if the first drafts are still the-way-they-were. I think it was Nancy Yeager who talked about naming protocols that just turned on a light bulb for me; a good way to keep the various drafts in order. (-: It’s good to have writer buddies from the business world! My hope for a (late) 2019 publication date just went way up.